I’ve been so antsy to share this recipe with you! It’s one of those I-put-a-bite-in-my-mouth-and-suddenly-my-eyes-widened-to-the-size-of-Pluto dishes. One of those I-stared-at-Mike-impatiently-waiting-for-him-to-take-a-bite-and-have-Pluto-sized-eyes dishes! One of those I-could-eat-a-Pluto-sized-bowl-of-this-stuff dishes! I’ve been trying to redeem myself for Mike’s terrible birthday dinner disaster for awhile now. Sure, I’ve made some delectable things since then, but I knew my penance wouldn’t be truly complete until I made him some really good pasta. This recipe was one of the WOW ones I came across. The photo of the dish was submitted by Kate of Framed, who called it “extra special.” That — combined with her charge to throw out all your other carbonara recipes — gave me confidence. 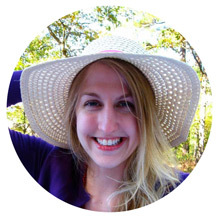 I’m not going to lie, something about her blog’s exuberant header photo probably also made be feel exuberant about linguine! Regardless of the reasons, I decided that this was the recipe I’d been searching for! As if you needed any more encouragement to make this pasta, the original recipe is straight from Pioneer Woman’s site (a Pastor Ryan recipe, for those of you who follow her posts). P-Dub has never steered me wrong, and on top of that, she’s coming to Charlotte this Friday for a book signing! What a perfect time to make a meal from her blog. I guess the only thing left to tell you about is the most important part: the taste. 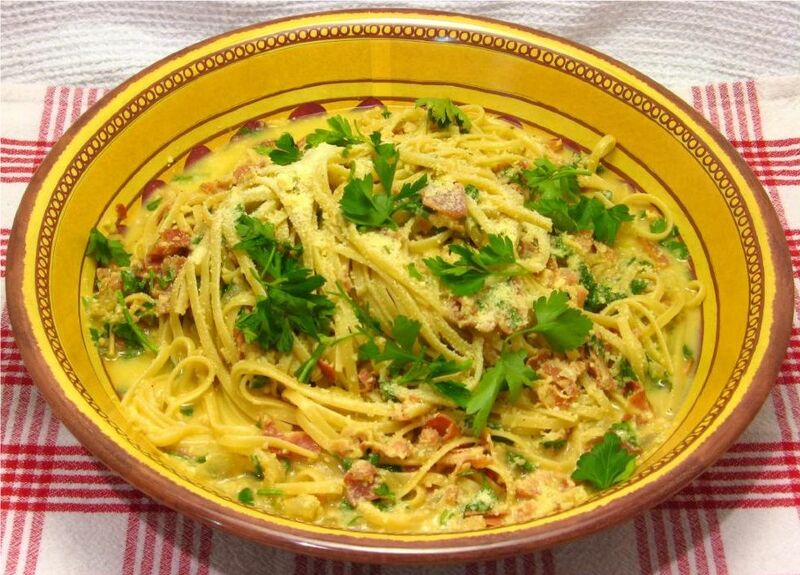 The last time I ate pasta carbonara was in Little Italy in San Diego, so the creamy, rich, buttery sauce and the salty punch of the pancetta was a wonderful memory. I have to say, though, this rendition was even better than the one I remember. Bunches of torn parsley add a fresh note to the otherwise deep and indulgent pasta. One flavor I noticed that stood out was the wine, so pick a good one — but don’t ask me how to do that! I picked my wine because it was white and had a penguin on the bottle. I got lucky, though, because it tasted perfect in the sauce. It was a Pinot Grigio, in case you want to replicate my random choice. 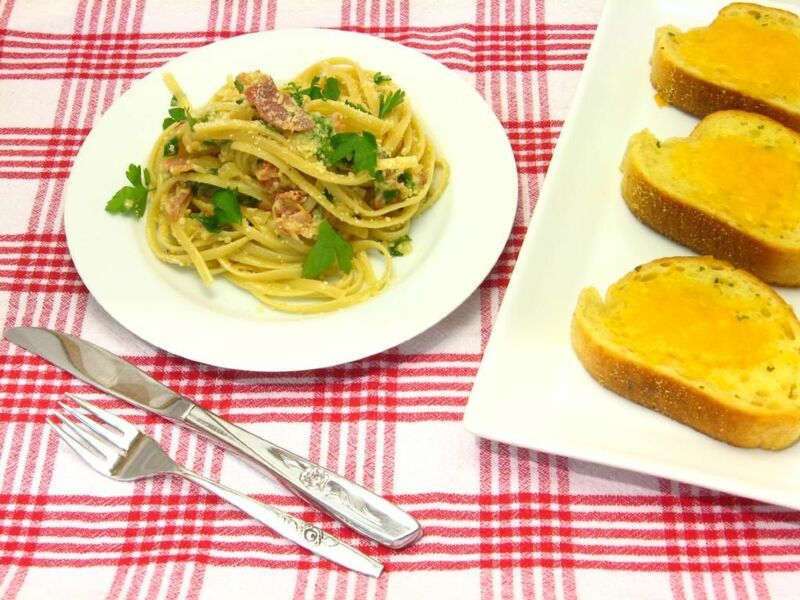 We paired our pasta with some cheesy garlic bread, and it was such a great combination. Actually, I considered making some big homemade garlic croutons to top the pasta itself, which would have been delectable if you want to give it a go. Make this as soon as you can manage to throw some linguine into your shopping cart. Bon Appétit! Yields: about 4 servings, if you’re us — perhaps 6 servings for normal folk. 1. Cut bacon into pieces about one inch wide. Cook until browned and crisp and set aside, saving bacon grease in the skillet. 2. Cook linguine in salted water until al dente. 3. Add chopped onions to bacon grease and let them cook down over a medium-high heat for a couple of minutes. 4. After the onions have cooked for a couple of minutes, throw in the garlic. Adding it after the onions have cooked a little will prevent the garlic from burning. After the onion and garlic have cooked for another couple of minutes, remove from the pan with a slotted spoon. Discard the grease. 5. Place the pan back on high heat until it starts to smoke a little. As soon as the pan begins to smoke, pour in the white wine (or chicken stock). Whisk until pan is thoroughly deglazed and all of the brown bits have come off of the bottom of the pan. Add 1 cup of chicken stock. Return onion and garlic to the pan. Let simmer over medium heat. 6. Crack four eggs into a large bowl. Add most of the Parmesan cheese, and roughly chop the parsley, adding it into the eggs as well. Leave a little Parmesan and parsley out for a garnish. Mix well with a fork. 5. Add the cooked hot pasta to the egg mixture and then add the onion mixture. Stir in ½ stick (1/4 cup) of butter and the cooked bacon. Mix it all together well. Pepper to taste. Garnish with parmesan and parsley. 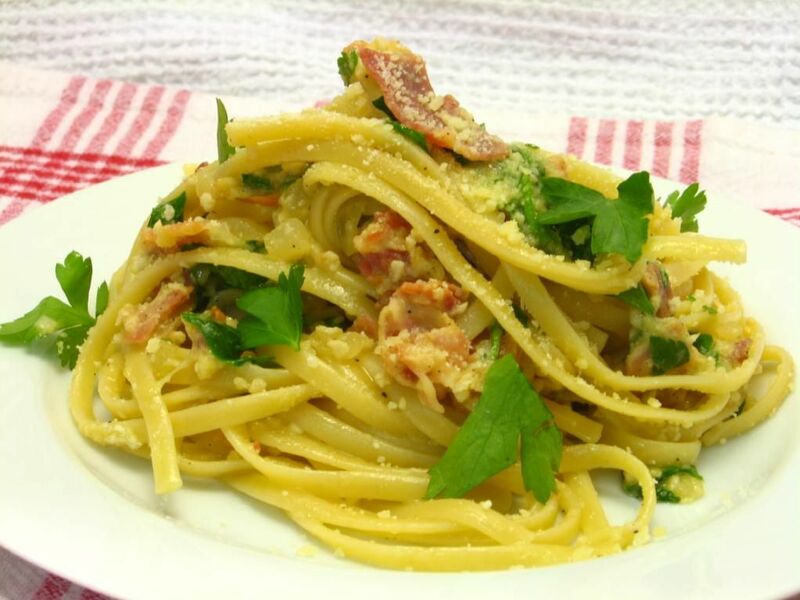 Throw out all previous carbonara recipes. This version looks so good! I bet the parsley does kick in a little fresh flavor. 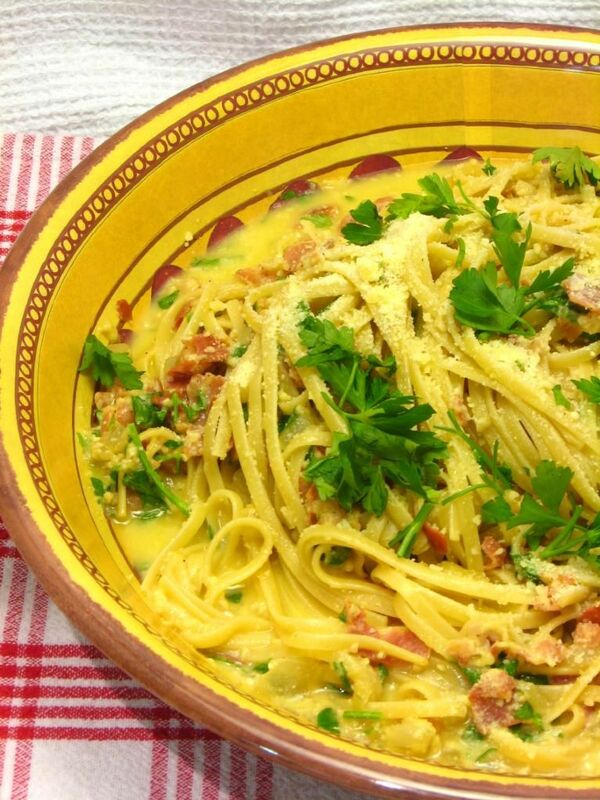 Pasta carbonara is my go-to weeknight meal for when we have little to nothing in the house. I make mine with just eggs, bacon, parm, and pasta. I want to try it with pancetta one of these times. (I also made one a while ago with red wine, which was pretty interesting.) I’m sure you’ve more than redeemed yourself for Mike’s b-day meal! Okay, okay. I guess I have to try this now. I do love me some Pioneer Woman. I’m so jealous she’s coming to your area this weekend! Have a blast!! 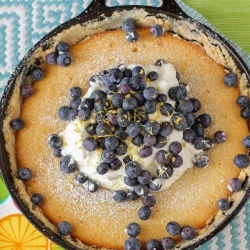 Yum, I have GOT to make this! I’m drooling on my keyboard right now! This looks awesome. Will have to try making it for the Husband. Tastespotting is basically one of my new-favorite-websites (it is, after all, how I discovered this blog!). 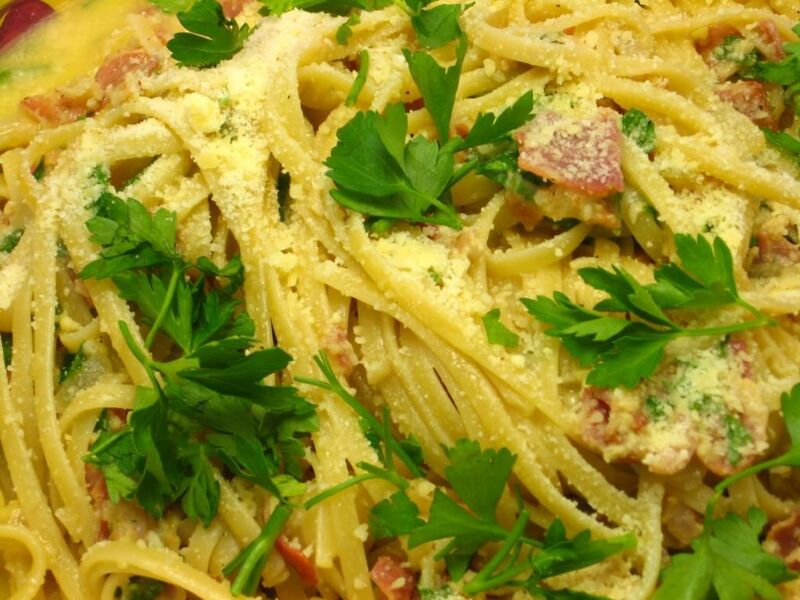 Carbonara is such a great dish…and yeah the wine is KEY (as is good parmesan cheese). This looks delicious! 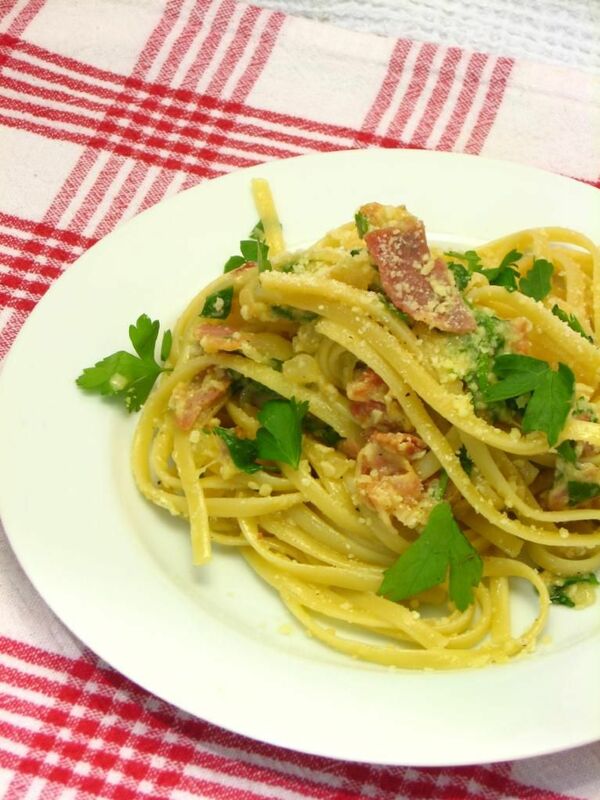 I’ve never made a great carbonara at home. I’m bookmarking this one. I’m not sure about the heavy cream — I feel like it would dull the flavor. But you know, I always say you might as well try anything in the kitchen once 🙂 The pork stock substitution sounds fine. Let me know how it goes! Made this for dinner tonight and it was fabulous! I’m so glad you enjoyed it, Cristi!! I loved, loved this dish. I went to the store to get pancetta and it was $5.99. For 3 ounces! I only bought two packs. I cooked it exactly as directed except for less pancetta. I will be making this again. My husband loved it as well. The parsley gave it such a fresh taste. Very good dish. So glad you loved it, Michelle — it is a favorite of mine, too! I had it again for lunch today. This is a great dish! So glad to hear that, Melissa!